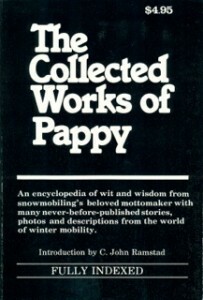 The Collected Works of Pappy - Midwest Sports Publishing Network, Inc.
A collection of writings by C.J. written under the non de plume Pappy during the 1970s that qualifies today as the sport’s classic time machine glimpse into the world of snowmobiling when we had points ignitions, premix, moon boots and vapor lock. In a question and answer format, Pappy provides words to live by as he reveals an amazing knowledge of the ins and outs of winter travel plus an intimacy with sled history, the elements of enjoying malt beverages, vintage parts searches and way more.